Who doesn't love a little friendly competition? A group of Texas bloggers recently met for a craft retreat where KariAnne of Thistlewood Farms encouraged our creativity with a challenge. 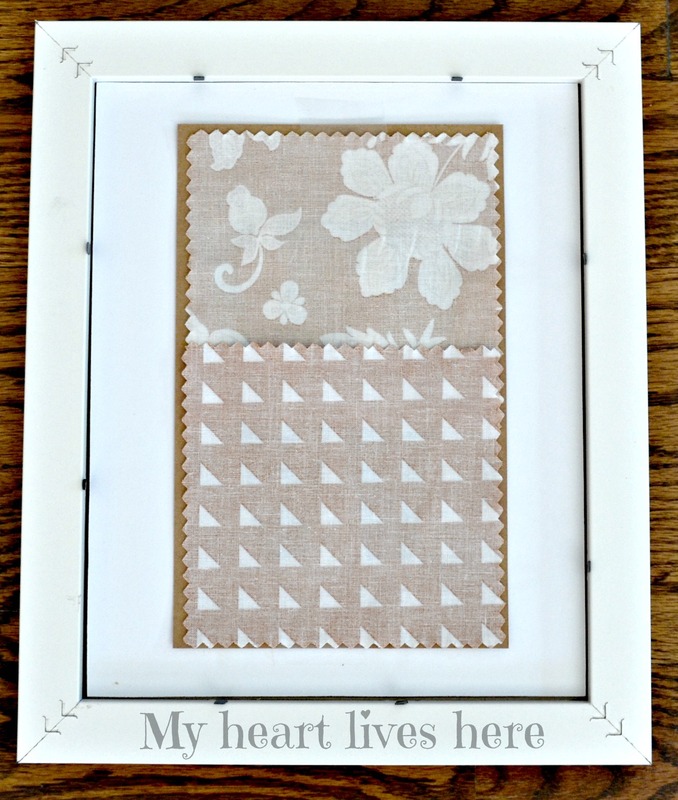 We were each given the opportunity to share a project using a charm pack of her beautiful Hoffman fabric line. I came up with this idea. 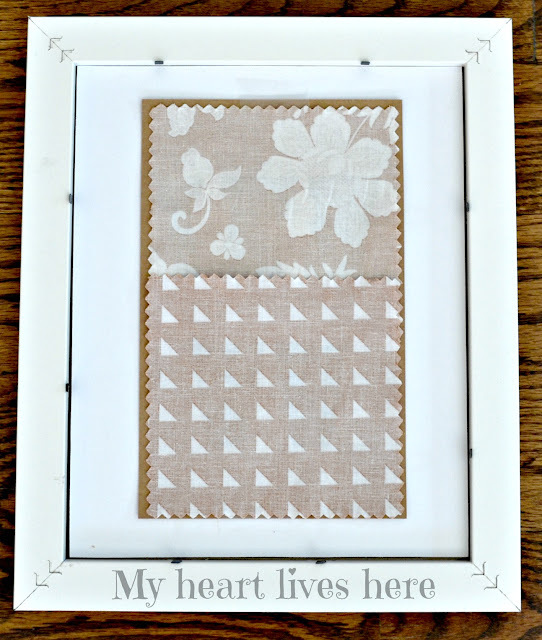 If you can put a picture in a frame, you can do this charm pack project. 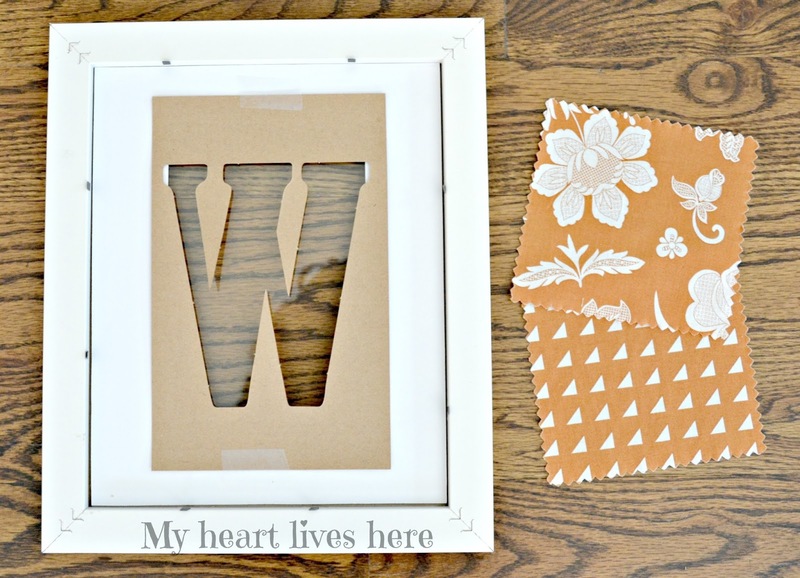 You will need these card stock stencils by Plaid. I bought them in the craft department at Walmart (under $4). Since there is one of each letter in a package, you may need two if you want to spell a word that uses the same letter twice. 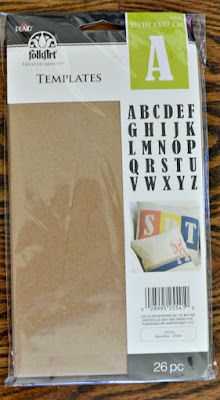 The card stock templates are intended for stenciling 5 1/2 inch letters. 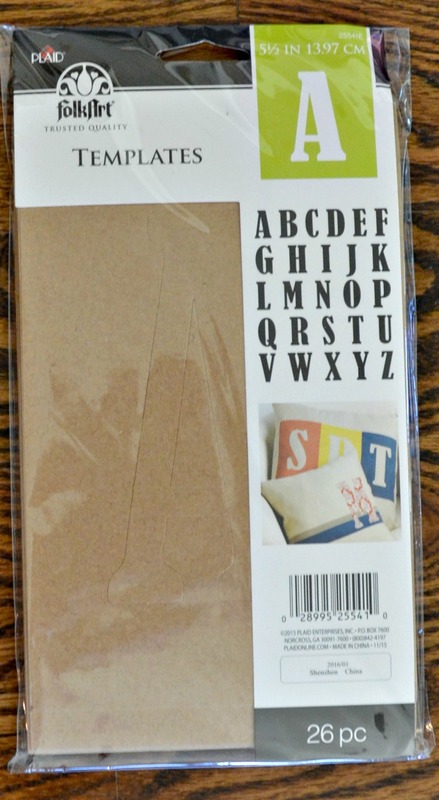 The same brand makes a 5 inch stencil in another font, but it won't work for this project since there are two letters on each page in that package. Simply tape down the stencil inside the frame and mat. Overlap two coordinating fabric squares behind the stencil. The pinked edge will show. That's part of the charm. The "W" is a little wide, but I found other letters fit comfortably in the 5 x 7 opening of the mat. I got away with using one fabric square for the letter "O" by laying it on the diagonal. Then, put the back of the frame on and start having fun making words and names. Or use one letter in a gallery wall. It works in a floating frame, too! Just don't eat buttered popcorn while you're putting it together. 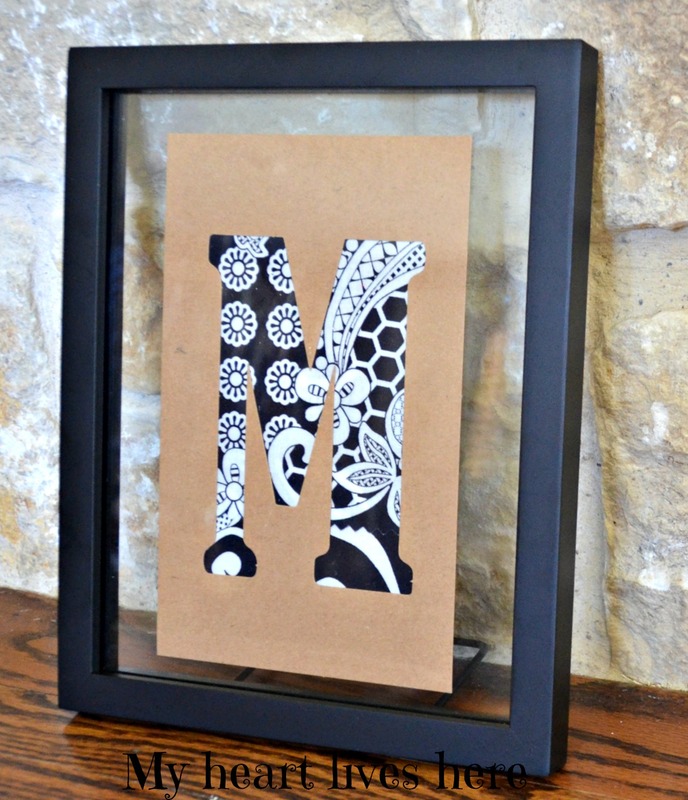 I am loving how KariAnne's fabric looks in this "M."
These frames come with optional stands. Since nothing is glued down, one day it could say "BLOOM" another day it could say "LOVE" or "HOME" or "BAM." Please vote for my project in KariAnne's contest! Voting starts st 6:00 a.m. on Thursday, July 14th. I love the project! You are so much fun! PS I hope you feel better soon! Six screws in your ankle!!??? Tell me you are NOT really posting on your computer from your hospital bed! Your project is fantastic. I love letters of any kind and these are just great. You deserve the pity votes, but you deserve votes even without the pity factor. First off I want to say that I am so thankful your surgery is behind you and that you are now in the next phase of healing! I love letters and I love these!! Turned out so perfectly cute and you have incorporated them into you home in such a neat and inspiring way. Thank you so much, Jemma! I am very pleasantly surprised at how good I am feeling so far. I will be writing the anestesthesiologist a thank you note! What a cute project, Eilis! But, blogging post surgery?! You truly are Superwoman! Wishing you a speedy recovery! Shenita, you are too sweet. I just added a few words to a post I had ready. Really this was a great distraction from real life! These are so fun! Love the letter idea and I agree the M is awesome! Eilis, what a great use of the charm pack fabrics! You are too clever!! I know you're thankful that your surgery is behind you, and I hope that you'll feel better soon, sweet friend. Love and hugs are sent your way! Thanks so much, Kitty. I am really feeling everyone's good thoughts. Thanks so much for stopping by, Summer. Thank you, Laura. I hope to! I hope you are doing well! I'm so sorry to hear about your surgery. I hope it all heals nicely. I love your Sweet Tea fabric letters. So adorable. Get well soon. Thank you, Katie. I had been putting it off for a while. It's a relief to have done it. First of all, I'm sorry to hear about your surgery. Glad it went well and prayers for quick healing headed your way. Your project is so clever and too easy. Love it! Thank you, Cecilia. Easy is my favorite kind of project! What a fun, creative idea. And it showcases the fabric so beautifully. I can picture this idea in every room of the house! I hope you feel better soon. Thanks so much, Debra. They are pretty versatile. Such a great project! This would make a perfect gift too! So happy we got to do this challenge together. It was fun! Glad I got to meet you (even if it was only quickly). Happy to hear about your surgery went on good.Each letter looks beautiful. They have unique design in them. How wonderful is this!?! I love this idea! 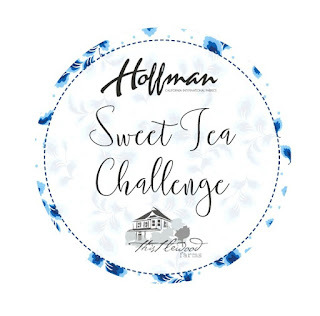 I'm one of KariAnne's Sweet Tea Ambassador's and love, love, love the fabric, don't you? You have inspired me! Thank you, Jennifer. The fabric did make the challenge easy!